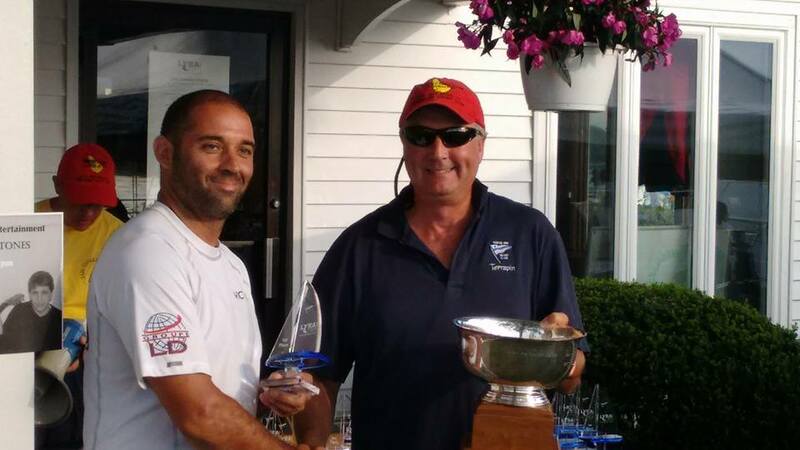 The Kingston winds and Race Management did not disappoint in another successful Olson 30 North American Championship. Hosted by CORK at the Portsmouth Olympic Harbour, the 2017 NAs came and went with both thrills and spills. Day 1 saw classic Kingston prevailing strong SW breeze and chop which unfortunately proved too much for Smoke’Em’s mast and an O’Naturel crew’s shoulder (both broken! we wish both spar and body a speedy recovery); four races course were completed ending with tight standings. Day 2 APed one hour while the breeze filled-in to light conditions; the LD was completed with O’Nat leading the procession followed by Investors Group and Boom (with guest helmsman, and notoriously good past Olson owner, Scott Mundle). Day 3 opened with extremely tight standings – it was anyone’s trophy for the taking – strong breeze but from the unconventional NE saw O’Nat and Ritalin trading 1s and 2s. 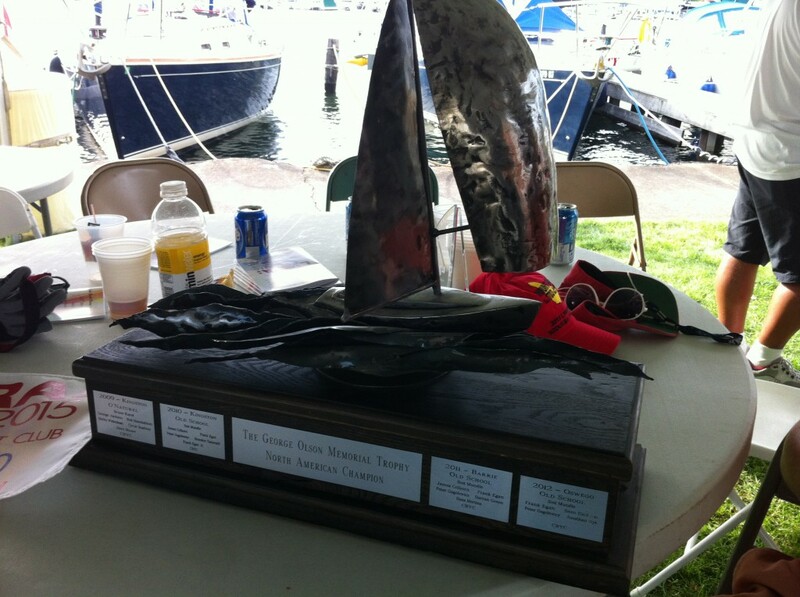 Once the dust settled, the George Olson Memorial Trophy was awarded to Ritalin from the Kingston Yacht Club. ENTRY IS OPEN!!! Sign up now for the regatta and party, $10 tickets gets you dinner and 2 regatta drinks. Come out and play while supporting our future sailors. Dedicated 2016 NAC’s page now up here. Event planning will be contingent on a minimum of six interested boats; please respond asap if your boat is interested. We have a new Hull Database form. If you have recently purchased or sold an Olson 30, if you have moved with your boat, or if you are just not sure if your Hull info is current, please take a few moments to complete the form with your latest information. All data is kept private and is only used for the Olson 30 Hull Database. 2015 North American’s dates & venues discussion now open! Great Lakes & Northeast members, check out the Forums for discussion on venues & dates for 2015 NA’s. Click here to pay your 2016 Olson 30 Class Association membership. Only Active members are eligible to enter Class sanctioned events. Early in the new year will be introducing a new password protected user area for Class Members. This area will only be accessible to members who have paid their dues. 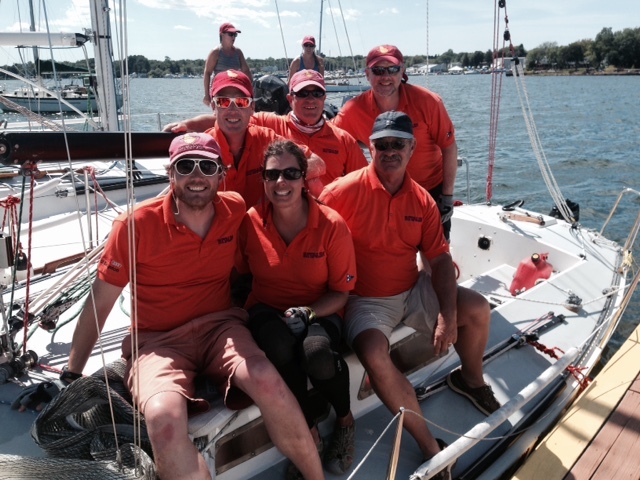 The crew of Ritalin on the raft at Sodus Bay Yacht Club. 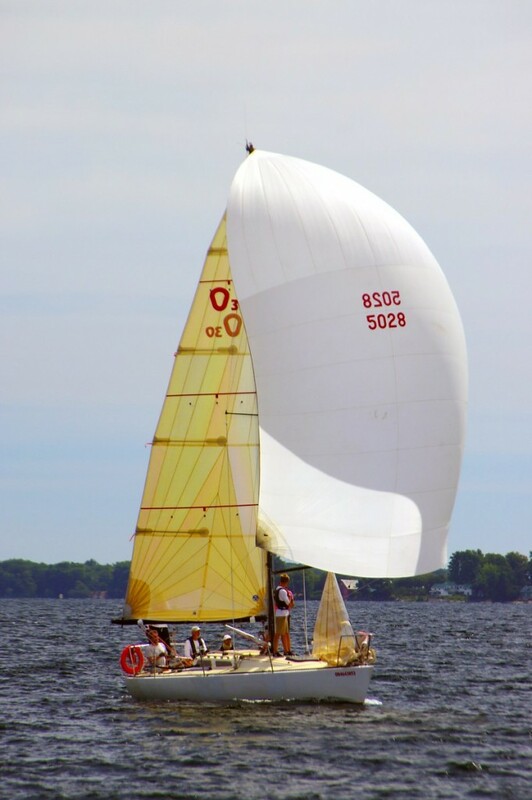 The 2015 Olson 30 NACs in conjunction with LYRA (believed to be the oldest association of yacht clubs on the continent!) was hosted by the beautiful Sodus Bay Yacht Club. In addition to SBYC’s general amenities, they were set-up with dining tent, music tent, and outdoor tiki-bar with local and domestic chilled brew on tap. Each night the dining tent was packed with sailors sharing stories of that day’s race while enjoying the nightly feast: Pasta dinner, BBQ chicken, Pulled-pork, Burgers and Sausages. The party moved quickly to live music under another tent complete with outdoor dance floor. Those that still had the energy closed out the evenings at the Sodus bars (Capt’ Jacks – a fan favourite). Six boats registered for Thursday’s long distance course which opened the event. The course followed the shoreline west and upwind toward Pultneyville, then a long downwind back past Sodus Bay to Port Bay, then upwind again back to Sodus peer. It was a windy day with big shifts that lead to a commanding victory and presentation of the long distance trophy to Victrix (aka Surfer Girl from Quebec City), followed by High Anxiety (from GYC in Rochester), Ritalin (from KYC in Kingston), and Chicane (the home-town-hero from SBYC). The long distance race was not eligible for a low score throw out, so it set the strategic stage of the following races. Course racing followed Friday through Sunday on Charlie course which presented almost every condition possible on the open waters of Lake Ontario: 25kts and 6ft waves to 0kts and flat calm, a brief line squall, and one 90° hard shift; racing was also enhanced by sharing the race course (separate starts) with J-80 fleet (~12 boats), R boat fleet (~6 boats), and C&C fleet (~6 boats). LYRA also had Alpha and Bravo courses with about 30 additional PHRF boats on each. 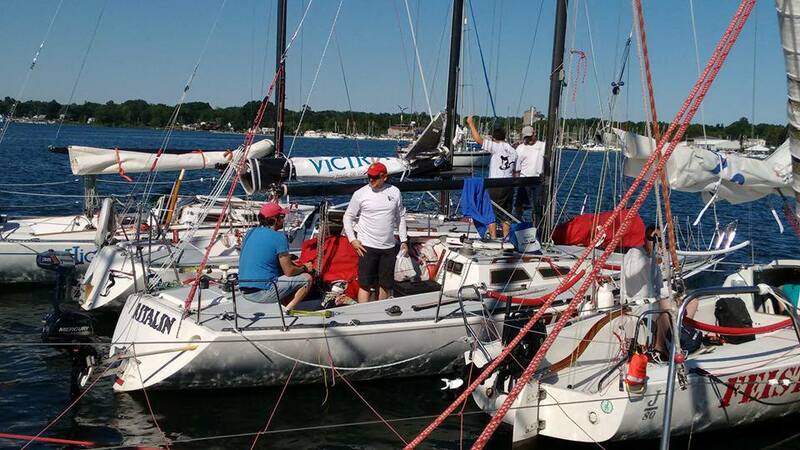 The Olson 30s observed thrilling starts with all boats getting off the line in tight quarters. The fleet battled early for control of the favoured side and race winner was generally the one who gained control early. Atop the overall podium observed Ritalin bringing the George Olson Memorial trophy back to Canada after High Anxiety’s (USA) win last year; Victrix took red flags and High Anxiety took blue flags. Olson 30’s on the raft at SBYC. The club is spectacular and our hosts put on a fantastic event. 1. The best RC I’ve ever experienced. Constantly chatting on the radio with updates of next start, end of day racing, course changes, counting down each start flag sequence. And true up-wind-down-wind courses with appropriately distanced weather marks with off-sets. 2. An introduction to ramp launch and haul of Victrix!! Dave’s custom trailer with elevated keel guide bars and keel stop is lowered down the ramp off of high-test ropes tied to his truck hitch. The trailer is submerged up to the pads which are duct taped on (so as not to float off or rotate); the boat is slowly motored into place; another set of lines, running from the front of the trailer back to the kite blocks then forward to winches, are used to pull the boat forward into place. Amazing! No Caption Needed. 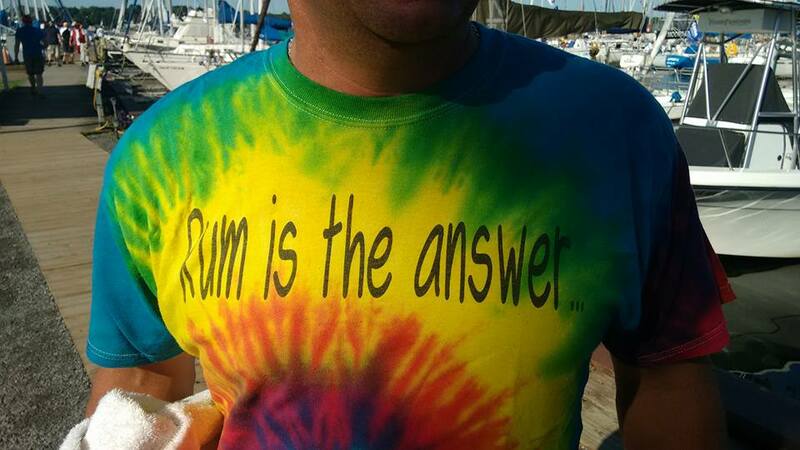 It’s a regatta, after all. 3. My first broach while helming Ritalin/any boat; a daunting moment when you realize that you are NOT in control anymore. It was Saturday, the fourth race (2 of 3 that day) on the last downwind leg, the windiest day with breeze above 20kts and big waves, all boats were rigged with jibs and only Ritalin reefing the main. We rounded the windward mark with a comfortable lead over Victrix: “Pole-on, but hold the hoist until we see a kite behind us…” [pause as Victrix rounds] “…damn, she’s hoisting, kite up!” We were close to finishing when the boat started to speed-wobble in the waves (hind-sight, I should have heated up early to gain control, but was trying to make the finish line with-out gybing). I tired to keep the mast under the boat with hard tiller corrections, but things were oscillating exponentially: “I’m loosing it!” [bang; the boat rounds to leeward hard, tips, and the spreaders hit the water; the boom swings from vertical down towards the water, the boat sits oddly calm on her side almost as if waiting for us take a moment to reflect, then slowly turns back downwind and wrights itself; the kite flogs] “Get it flying – no, put it away – no, get it flying – NO, put it away!” Once we get the kite down and boat under control, I look back over my shoulder to see Victrix surfing towards us at twice our speed, my heart sunk… then out of shear luck?karma? ?Neptune’s grace??? – Victrix’ kite snap shackle breaks open and the kite falls gracefully into the boat. We finish wing-on-wing a few boat length ahead of Victrix. 4. The delivery home. With a thrilling lightning storm the night before and heavy cloud cover and cells on the radar forecast, we set off at 7am back to Kingston with Breakaway-J (a J-80 also from KYC). With our delivery crew of 3 and 2 on the J, we all decided to stay within radio communication unless we felt comfortable with the conditions. Starting at 25kts wind swinging 5o every 10mins from NNW to SW, we plowed down waves on reefed main only bearing 20o aiming to take Main Duck, Pigeon, and Simcoe Islands to starboard. The wind dropped to 15kts while the next storm front sucked up power; we shook the reef and hoisted the jib and sat anxiously for the rain to hit. Pitter-patter, then full on low-visibility down-pour. Wind back up to 20kts, we felt comfortable with full main and jib. 15mins of showers, then the clouds parted, the sunscreen was passed around, and the wind held at 20kts. As we passed Simcoe Island and turned towards KYC the depth shallowed and wave height increased, we were able to hold win-on-wing with the spin pole taking whisker pole status holding the jib out full. Max boat speed 13.3kts!!! The end numbers were 10hrs dock-to-dock, avg 6.3kts boat speed, 1 round of coffee, and 2 rounds of hot cup-a-soup. 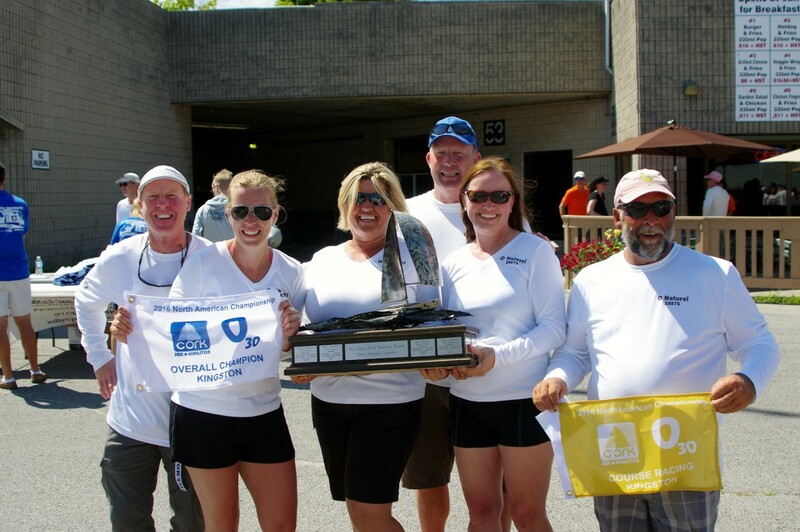 George Olson Memorial Trophy returns to the Great Lakes! I hope our fellow racers made it home safely. In general a truly wonderful regatta that will be hard to forget. Can’t wait to race for the trophy next year. 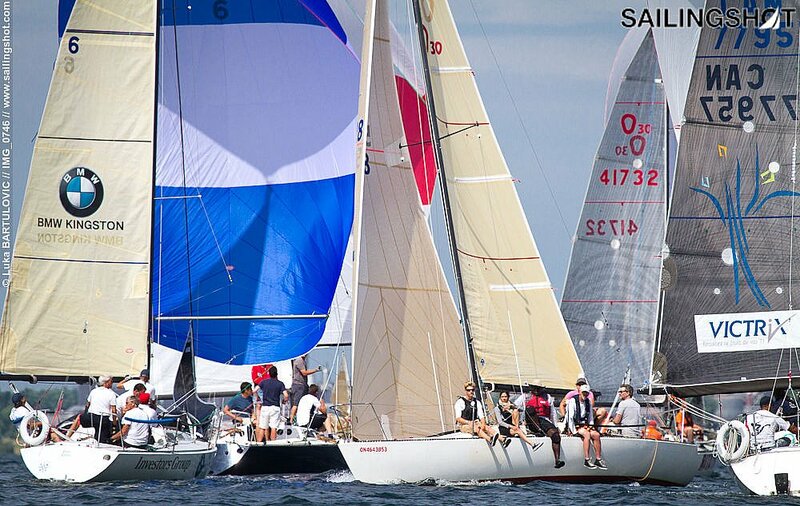 Dana Point Yacht Club has extended and invitation to the Olson 30 class for some OD racing Sept 12-13. The event benefits our local youth sailing foundation and is a great venue. In the water storage available, free. 2 Ton hoist for launching and dry yard for trailer storage, free. Party both nights, raffle, dinner and drinks Saturday night with trophies Sunday. Please see link below for entry information. So far we have 4 local Olson’s attending with 2 more perspective’s. Come out and support a good cause while having fun on the water.